This post is for sharing feedback on a long time occupant of my makeup bag. Though not a new launch, I wanted to write about it because I love it so! I have finished tubes of it since I discovered that with this one product I could minimize products used & time taken for my daytime makeup routine. 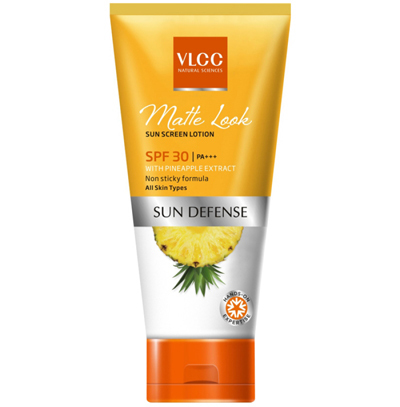 This product meets multiple needs of a matte finish sunscreen, moisturizer and a tinted foundation – which gives a light,even coverage while protecting you from harmful UVA & UVB sun rays . A bonus I discovered is that it helps cancel out skin redness ( which am prone to)! The ingredient list is all natural and its suitable for all skin types. Packaging I love the uplifting Orange-Yellow packaging of the product. 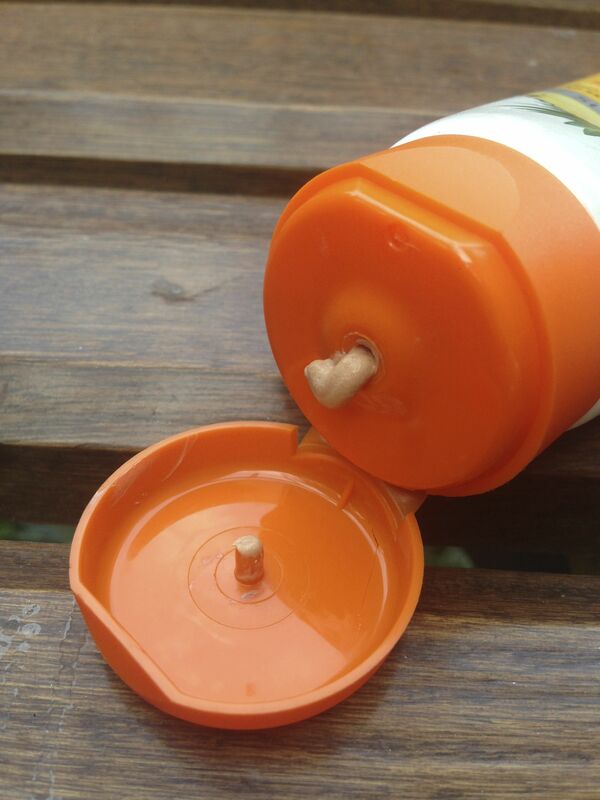 It lists all ingredients and the lotion flows smoothly through the nozzle. Handy to carry & spot in your cabinet or bag! Product It’s a broad spectrum sunscreen, with SPF 30 PA +++, for a long duration sun protection from both UVA and UVB rays. It is moisturizing and hydrates the skin , non-sticky & provides a great matt finish, which is so needed during our sweaty summers! I love the beige tint as it covers minor blemishes, skin redness and evens out the skin tone. One doesn’t feel the need for more coverage after using this product ( you can set it with some loose face powder or compact, if need be). 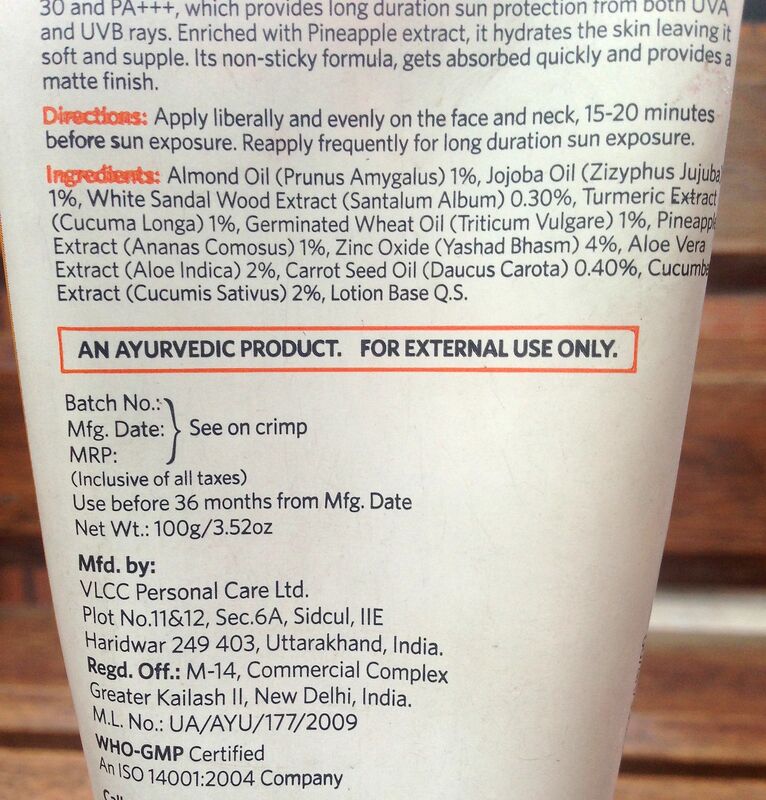 Ingredients The label lists ‘ Almond Oil, Jojoba Oil, White Sandal Wood Extract, Turmeric Extract, Germinated Wheat Oil, Pineapple Extract, Zinc Oxide (Yashad Bhasm), Aloe Vera Extract, Carrot Seed Oil, Cucumber Extract’ and is mentioned as an ‘Ayurvedic Product’. Available at your nearby chemist chain or cosmetics store. You can also buy it online at Jabong , Flipkart, Myntra . You may also want to take a look at an earlier review for Rustic Art’s Organic Sunscreen Lotion, which uses completely organic ingredients. This is another barrier against the summer Sun that I love! 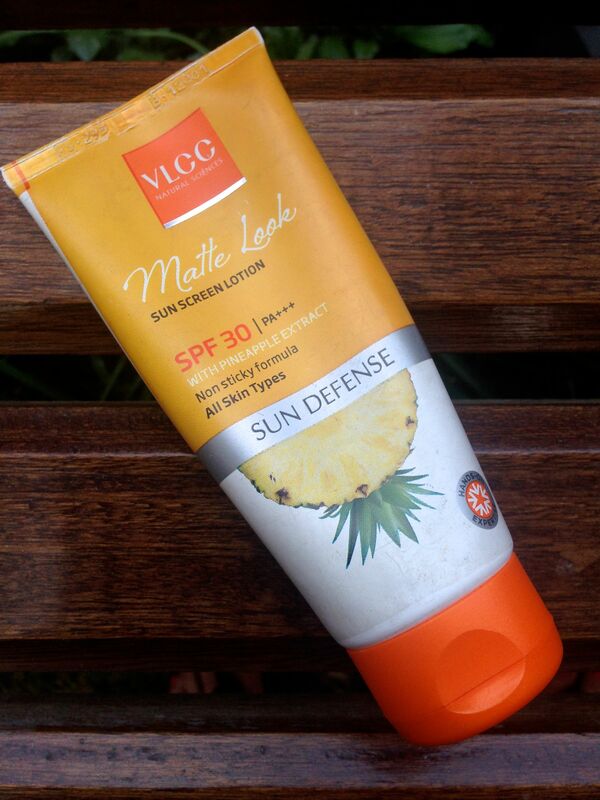 Have you used the VLCC Matte Look Sunscreen Lotion? Drop me a line on your experience with it! Glad you like it Mansi & thanks! I can’t find this product in market, not even online. Is this not available anymore.?? ?